Click Here to Apply for Financial Inclusion Africa Board Fellowship 2018. Financial Inclusion Africa Board Fellowship 2018… The Africa Board Fellowship connects board members and CEOs through peer learning and exchange to strengthen the governance of financial institutions serving low-income clients in sub-Saharan Africa. 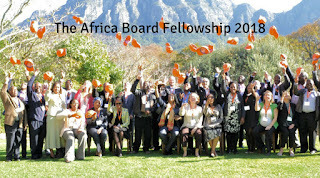 The Africa Board Fellows (ABF) program focuses on strengthening governance, improving risk management practices, and building strategic leadership abilities among leading board members and CEOs of microfinance institutions in sub Saharan Africa. ABF is designed to explore a variety of priority topics for the region, including board dynamics & responsibilities, risk management, strategy & managing sustainable growth, technology trends and innovations, navigating competitive and challenging environments, and client centricity. The only out-of-pocket expenses for fellows to participate in the Africa Board Fellowship program are the travel costs of getting to and from the two in-person seminars. Once fellows arrive at the seminars, costs associated with hotel accommodation and food will be covered for the duration of the seminars. Fellows would cover any additional costs incurred if they decide to extend their travels, bring additional guests, or exceed the specified allotment for hotel incidentals. All fellows are required to stay at the location being provided for the seminars. The Africa Board Fellowship (ABF) program is for board members and CEOs of institutions working toward financial inclusion throughout sub-Saharan Africa. The program requires an institutional commitment and suggests that the board chair, CEO and at least one other board member attend the fellowship program. Ideally, at least the board chair and CEO would attend together as part of the same class and then additional participants from the institution can join future classes. On select occasions, individual representatives will be selected as fellows for the program on a case-by-case basis. They are looking for fellows who are eager to share their experiences, learn from their peers, implement changes and strengthen their governance, risk management and strategic planning.